The world’s longest relay run which promotes global peace was welcomed to Coventry at the internationally-recognised peace forum being held in the city. 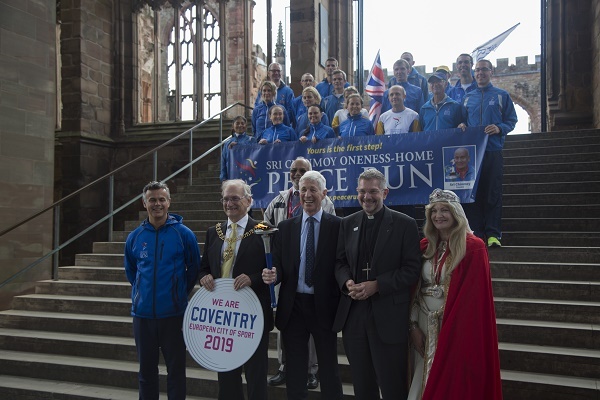 The Peace Run’s team of 16 international runners were greeted by the Lord Mayor of Coventry, Cllr John Blundell, and The Very Revd John Witcombe, Dean of Coventry, at the RISING Global Peace Forum which was being held at Coventry Cathedral. Professor Mike Hardy, chair of RISING and executive director of the Centre for Trust, Peace and Social Relations at Coventry University, and Paul Muller, from Coventry University Students’ Union, who are organising the Coventry Half Marathon in 2019, were also at the welcome. Nobel Peace Prize winners and former heads of state have joined peacebuilders, policymakers and academics from around the world at RISING 2018 to discuss and promote new ways to make and sustain peace. More than 200 delegates have been attending the two-day symposium which drew to a close today (Thursday, September 13). The Peace Run’s symbolic flaming torch carried by the runners on their seventh-month journey across Europe was also given a blessing on the closing afternoon by The Very Revd John Witcombe. The annual Peace Run has covered over 395,000 miles and been welcomed in over 160 countries, contacting people around the world in a message of peace, friendship and harmony, since being launched in 1987. This year’s European Peace Run began in Bulgaria in February and was in Coventry, the UK’s only City of Peace and Reconciliation, as part of its tour of the UK. It was a special moment for Devashishu Torpy, director of the Europe Peace Run, as his father was brought up in Coventry. His father Peter and brother Sahadeva joined the welcome party. Devashishu said: “We are really honoured and delighted to be here in this very significant city and building where peace is being treasured and valued through gatherings such as the RISING Global Peace Forum. RISING 2018, themed on the ‘Anatomy of Peace’, has been focusing on the complex process of initiating contact, making a deal and sustaining peace. RISING was launched in 2015 as a partnership between Coventry University, represented by the Centre for Trust, Peace and Social Relations, Coventry Cathedral and Coventry City Council. Former Irish Prime Minister John Bruton, and Nobel Peace Prize winners Ellen Johnson Sirleaf, a former President of Liberia and first democratically-elected female African head of state, and Tawakkol Karman, a highly-prominent human rights activist from Yemen, have addressed the Forum. Cllr Blundell said: “It is a real honour for the Peace Run to visit our city as it really echoes the beliefs and values we hold so dear.